There are three tours available at Fortune Farms, as shown on the illustrated trail map. Download a print-friendly trail map [PDF]. Scroll down for details of each trail. The Heritage Trail marked in red is almost 1 km long and passes all the points of interest It includes a cedar swamp and wet land, a large portion of the sugar bush and the plantations. It takes 30 minutes of fast walking and 1 hour to fully appreciate all the stops. The trail map shows the major features which are identified with trail signage. The Sugarbush Trail marked in green is about 1/3 km in length and passes through a mature portion of the sugar bush. It also includes a stop at the very majestic tall pine trees and passes by the old sugar camp and boiling kettles. 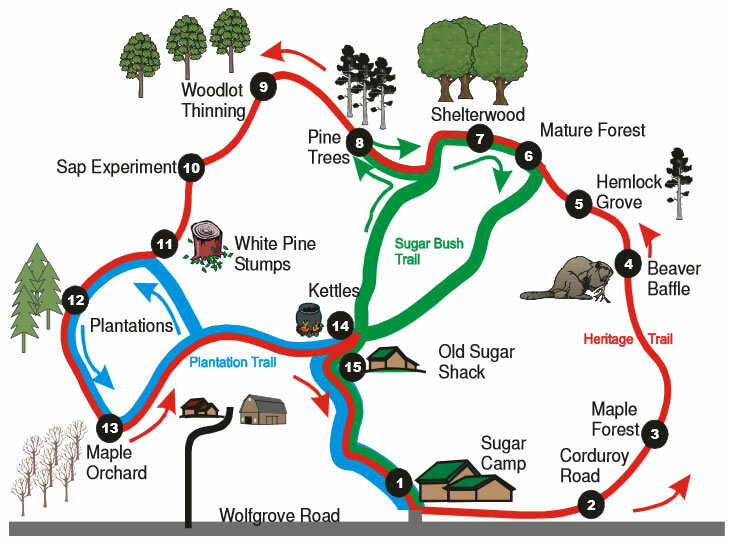 This is a good trail to take during the sugar season as it features the sugar bush and syrup making processes. The Plantation Trail marked in blue is also about 1/3 km in length and passes through the red pine and maple plantations. It is good trail to take if you are interested in forest management and forest regeneration. The trails are not plowed so during the early sap season good snow boots will be necessary. Good trail footwear is recommended for all other seasons. The trails are open daily during the sap season and by appointment in other seasons. Dogs on leash are permitted. The trails are in natural condition and not suitable for wheelchairs or walkers. Should you not have time or desire to walk the trails you can take a virtual tour with pictures.